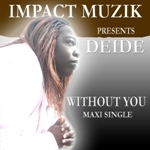 Description: Deide's Music, is the Perfect example, of Where Muzik Meets Souls. Her music will touch you Deeply.
. Style: Urban Gospel Started: Singing at age 4 Experience: Has done several events in GA, FL,N.C, and S.C. When the question is asked, what makes her stand out from the rest? The answer is, her originality, versatility, love & passion for her gift, also the leadership and guidance that Greater Faith Ministries provides to her. “She’s rooted”..